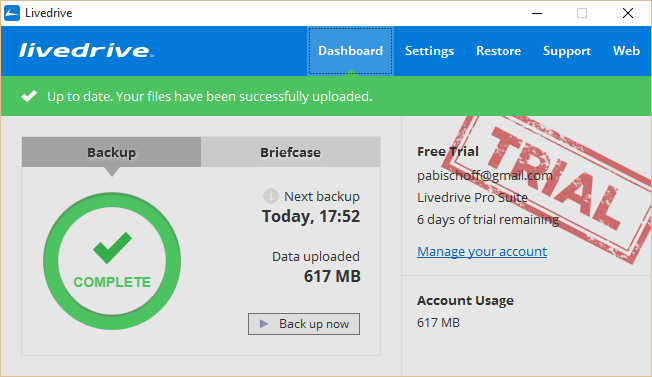 Livedrive Review | Is LiveDrive Online Backup any Good? Pretty much everything Livedrive offers in its basic tier can be found cheaper elsewhere, unless you really value the music and video streaming playback. Livedrive is a cloud backup service that tries to punch above its price range with bonus features you won’t find on competing providers. The added extras will be enough to sway some users, but not everyone will find value in what’s otherwise a par-for-the-course service. Livedrive’s basic service offers unlimited storage on a single computer for $7 per month with a one-year subscription. Additional computers cost $1.50 per month. The mid-tier “Briefcase” offering is similar to Dropbox and lets you store files from unlimited computers, up to 2TB for $13 per month. The ProSuite offers both backup and the sync-able storage of Briefcase, backing up five computers with unlimited space for $20 per month. For another $8 per month, you can add in NAS drives or other network storage locations. A free two-week trial of the ProSuite is available, but you’ll have to input a credit card number to take advantage of it. The Briefcase tier comes in the form of an added drive on your computer. If you have more than one computer, Briefcase serves as a synchronization folder that keeps files up to date instantly across all devices. 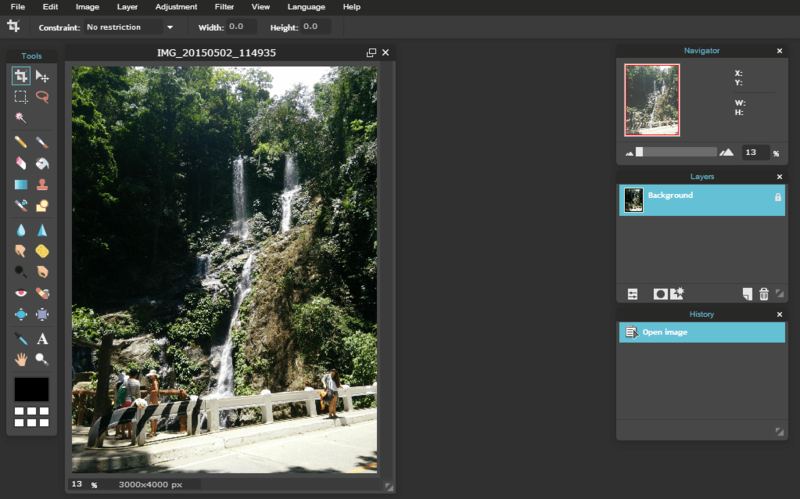 Livedrive allows users to edit documents and photos from the web and mobile app. It even includes a Photoshop-style image editor. 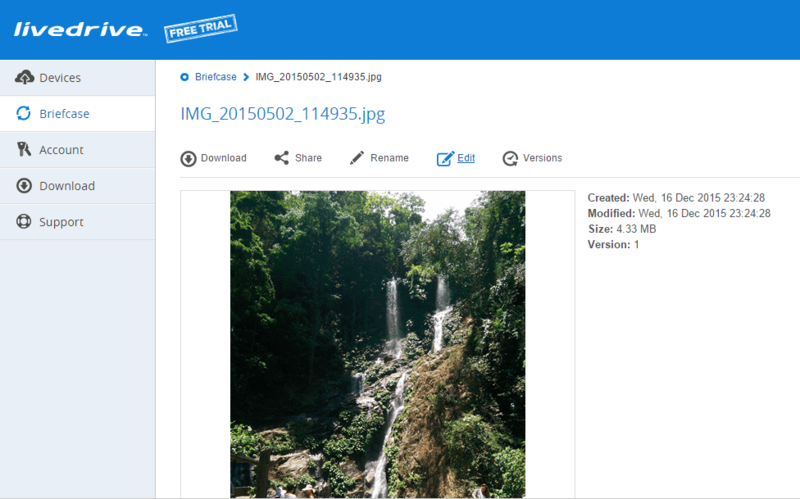 Users can share and collaborate on files, and photos can be uploaded to Facebook or Flickr right from your cloud. Only single files can be shared, not entire directories. The major hangup with all these features is that the files must be in the Briefcase drive, and not part of the standard backup. That means buying the second tier subscription. Briefcase can’t be an existing directory or drive either, which means files have to be moved manually into the new drive. Livedrive’s basic tier can stream music and videos stored in the cloud directly from the web and mobile apps. Combined with unlimited storage, this is probably the make-or-break feature for users with a lot of media. 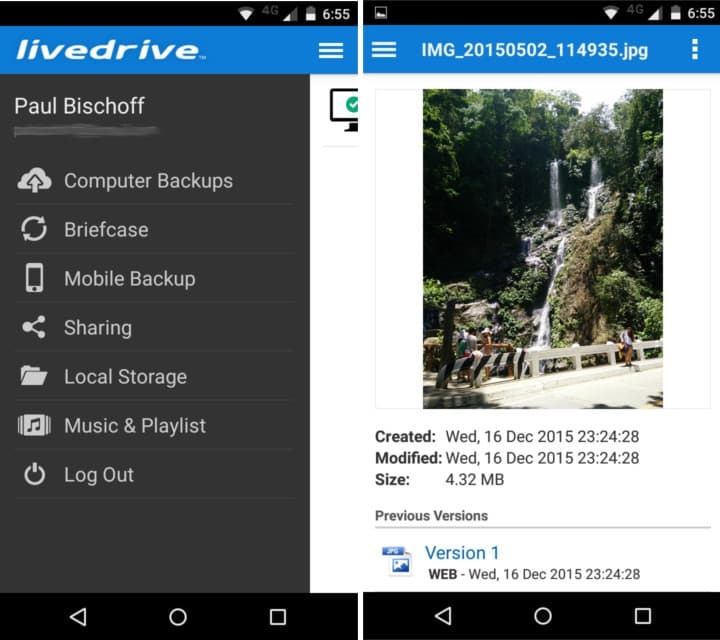 Livedrive doesn’t utilize continuous backup, a feature boasted by almost all of its rivals. Backup frequency maxes out at once per hour. 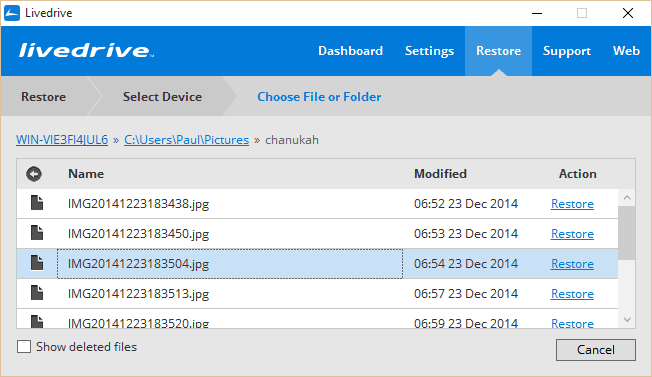 Livedrive lets users customize the priority of files; that is, which file types should be uploaded first. Users can specify specific file types to be excluded by their file extensions. You can also throttle the bandwidth used by Livedrive so it doesn’t devour your entire internet connection. If you have another computer on the local network, Livedrive will allow you to back up files to any other computer for free via LAN transfer. Sadly, it doesn’t offer full system backups, which means users are limited to protecting their user files–documents, videos, pictures, downloads, and the like–and can’t perform a bare metal restore that includes applications and system files. Livedrive will back up external hard drives, but it doesn’t exactly play nice with them. The EHD must be connected whenever backups are happening. If an external hard drive is backed up to the cloud but disconnected from the computer when the next scheduled backup comes around, the files will be marked for deletion on the cloud. That makes it easy to overlook because Livedrive runs in the background. Backing up an EHD with Livedrive is really only useful if you never disconnect it. Livedrive protects transfers to the cloud with the standard SSL encryption. Once files are on the cloud, they are encrypted using 256-bit AES encryption, which is for almost all purposes more than enough to keep your data safe. The downside is that Livedrive has access to the key used to decrypt the data, which means they could decrypt your files in cases of abuse or coercion by authorities or hackers. There’s no option to set a private key. Servers sit on US soil and, for what it’s worth, Livedrive is Safe Harbour compliant. All data is copied onto geo-redundant servers, which means even if one data center goes down, your files will be readily available on another from a different location. The Briefcase drive is not encrypted by default, but users can opt to encrypt it in the settings. The desktop app is simple and intuitive, but users who like to be able to tweak every aspect of the backup process might be left wanting. You can’t micromanage things like what days of the week to run backups, notifications, or whether or not to wake the computer from sleep to perform scheduled backups.The GUI has five tabs: backup, settings, restore, support, and web–the latter two open up the web app in a browser. The desktop app also doesn’t allow you to preview or share files, and it’s missing a search function. The web app is a bit more fully featured. This is where you’ll share, edit, and collaborate on photos and documents if you’ve got Briefcase. Images and videos have thumbnail previews and everything is searchable. You can also stream your music and videos right from your cloud storage and, if you’ve got Briefcase, post them directly to Facebook or Flickr. The web app allows users to access and restore files from any internet-connected device. The mobile app is the best of the bunch. It will automatically back up photos and videos from the phone’s local storage at no extra cost, and almost any other file on your phone can be backed up manually. Photos, music, and videos can all be previewed and played in the app, but there’s no way to preview text files. Music lovers will find a lot of value in the built-in music player on the web and mobile apps, which sorts by album, artist, and genre. The only downside is that music must be added manually to the playlist; Livedrive won’t locate music files and populate the playlist for you. Despite the promise of “24/7“ customer service, Livedrive has no live chat, phone, or Skype support. It solely relies on a ticket submission system, which in our testing took about one day to respond. Staff at least seemed knowledgeable about the service when we asked about a few security-related questions. The website hosts FAQs and a few tutorials, but there’s no user forums where customers can voice their concerns or comments. We’re happy to report Livedrive was completely spam free during our test period. We didn’t receive a single email, popup, or any other promotion pushing for upgrades. Annoyingly, cancelling account requires emailing the support team. There’s no way to do so yourself from the website or apps. Pretty much everything Livedrive offers in its basic tier can be found cheaper elsewhere, unless you really value the music and video streaming playback. The rest of the perks lie in Briefcase and Pro Suite tiers, which allow for synchronization and file collaboration, among other things. But at $13 and $20 per month respectively, it’s tough to justify the price. Signed up for a lifetime subscription via DripBit. What can you say about a service that took six months to back up my files online, consistently used up 30% of my memory, and then, when things went sour with DripBit, arbitrarily cancelled my subscription, no refund or recourse? Avoid LiveDrive like the plague. I bought a lifetime account last year via Dripbit as well. When I ran into an issue, Livedrive would not assist at all and told me to contact Dripbit. I never received any replies from Dripbit for any of the tickets I created regarding my issue. Now it appears Dripbit is no longer a reseller, and my “lifetime” account has been changed to a trial account by Livedrive and they will not honor my “lifetime” purchase. This is a hit-and-run scam in my opinion. Instead of taking Dripbit to task, they instead convert the users accounts into trial accounts and then tell you to pay monthly if you wish to keep the account active. My advice – avoid any resellers in the future for any type of online services. I can buy 5TB drives (I have two!) for around $120 for backups instead of spending money for online backup, and I’m sure I can restore/backup far quicker in this manner. My rating for Dripbit – 0%. Never responded to any inquiries or tickets created. My rating for Livedrive – 2%. At least they did respond, if only to tell me to contact the reseller for assistance and nothing else. Very frustrating and poor customer support, although the service is good. The interfaces are wierd and clunky though. I have had Livedrive Briefcase for many many months and backup before that but found Livedrive support to be totally useless and hide behind a ticket system. They do not even answer the question asked. I use it for business across two companies and five machines. Within the next two weeks I will go elsewhere even though they are more expensive. If their support team cannot even understand the question they are no good to me. UsenetIs Usenet free to use? UsenetHow do I find a file on Usenet? UsenetWhat do I need to use Usenet?